That was the advice given at the start of our hike up Humphrey's Peak. Rightfully so, as this was the hardest day hike I've done yet. 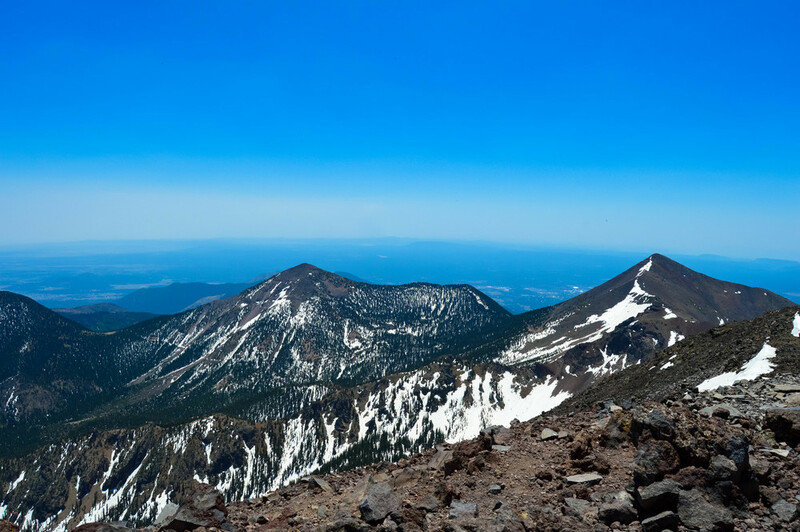 Part of the San Francisco Peaks, Humphrey's Peak is the highest point in Arizona, reaching an altitude of 12,633 feet. The 9.5-mile trail up the mountain (located near the Arizona Snowbowl) began innocently enough by crossing a meadow reminiscent of the one Julie Andrews frolicked through in The Sound of Music. Once we reached the shade of the trees, it was a beautiful hike through pines and birches. The first couple of miles were relatively flat and the weather was a perfect 50 degrees, which allowed us to better appreciate the morning scent of pine and birds chirping cheerfully around us. The hike became steeper and more difficult once we made our way through the foothills, but we were rewarded with some of the most breathtaking scenery I have ever witnessed. It seemed like the views overlooking the mountain became more awe-inspiring with every step. We reached the saddle (the popular stopping point) after about two and a half hours of hiking. It was here that we got our first glimpse of what lay on the other side of the mountain—and we weren't in the least bit disappointed. We saw the entire San Francisco Peak range, spotted with patches of snow and evergreen—along with what looked like the entire state of Arizona. A few photo sessions and a quick bite to refuel later, several of us started off towards the summit. That home stretch was by far the hardest part of the hike for me. The summit was another mile from the saddle and was much steeper than anything we previously encountered—bad news for our already tired bodies. The terrain was primarily red and black lava rock, which (for me) meant painstakingly stepping up boulders and exhaustedly stumbling over smaller rocks. After a large patch of snow just feet from the summit (I felt like Mother Nature was just taunting us at that point), we made it to the top of Humphrey's Peak. I can't remember the last time I felt that kind of relief and sense of achievement. The views were unlike anything I'd every seen and it was hard to not go philosophical and existential on myself. I kept thinking about what an incredible experience it was and, above all, how much I appreciated sharing it with such strong, inspiring women. My philosophical reflections turned out to be short-lived. There was a swarm of these strange little bugs that kept landing on everyone and had us eager to get out of there. Plus, we wanted to get a start back as it was already midday and we still had a 4.5-mile hike before we could even start for home. Our journey back down was an arduous one. The sand and loose lava rock made the trek down the summit almost as (if not more) difficult than the one up it. 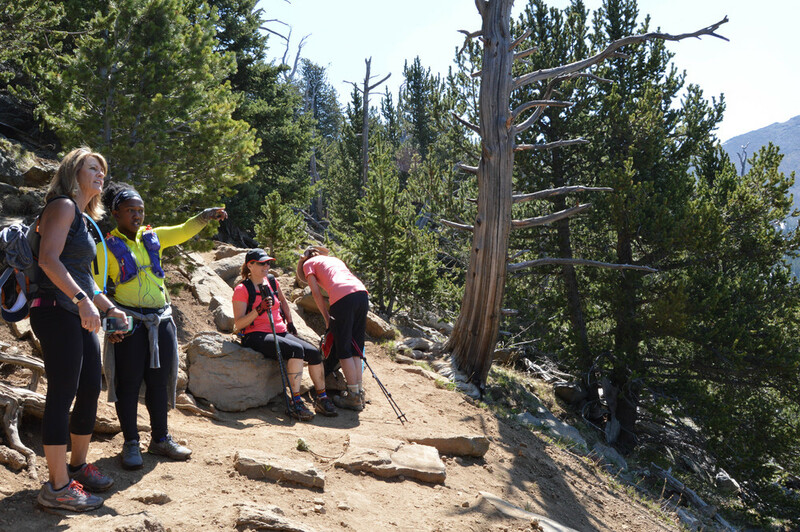 We had firmer terrain after the saddle, but exhaustion had me tripping over rocks and tree roots. The one excitement on the way down was our coming across a tribe of baby goats, which were being trained to become pack goats. They were the cutest little things—just grazing away on the side of a mountain. After our baby goat excitement, if felt like the trail was never going to end. The entire lower half of my body hurt with every step but I couldn't stop or my legs would start trembling. Sweet salvation finally came in the form of the open meadow—a much brighter green than it was that morning. As we emerged from the trail, we were greeted with hoots and hollers from the other women—already enjoying a cold beer. Not soon enough we were on the road home, reminiscing about our fabulous weekend in Flagstaff and discussing what our next adventure should be.